In this episode, I talk with Jason Fleagle and Adam Bankhurst, co-hosts of Grow Like A Pro Podcast from Jenesis Marketing Group. The Grow Like A Pro podcast is all about learning how to achieve your goals and dreams as a business owner. learn growth tips and hear success stories from entrepreneurs from all walks of life as they teach you how to grow like a pro. I know one great takeaway you will get from the podcast is how the two share duties as co-hosts. Ideally, co-hosts should divide the ... Más informaciones work in half. And these two talk about how they do just that! Subscribe to my free daily Open The Mic Newsletter at www.circle270media.com. It's chock full of podcast news you may have missed, as well as social media, sales, and audio production tips, and insights on how to grow your business podcast. If your business is using podcasting as a marketing or branding tool, I would love to showcase your podcast. Go to www.notetofutureme.com and scroll down to my booking calendar. Email us at podcasts@circle270media.com to set up time to talk more about your new or established business podcast. 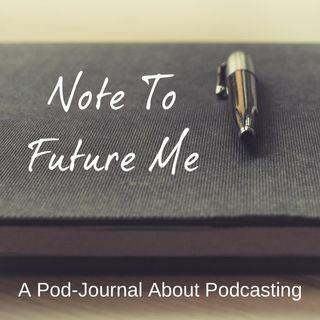 Why write a note to myself, when I can pod-journal my thoughts about podcasting? !